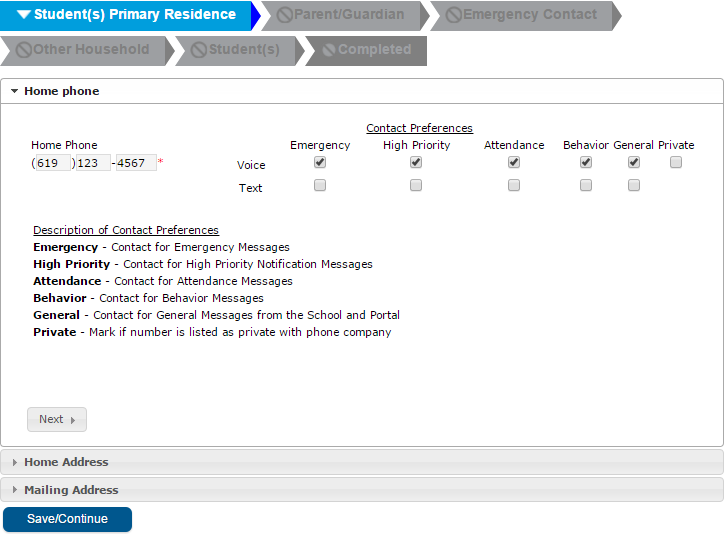 Enter Home Phone Number and check Contact Preferences boxes. Click Next to go to the Home Address Section. 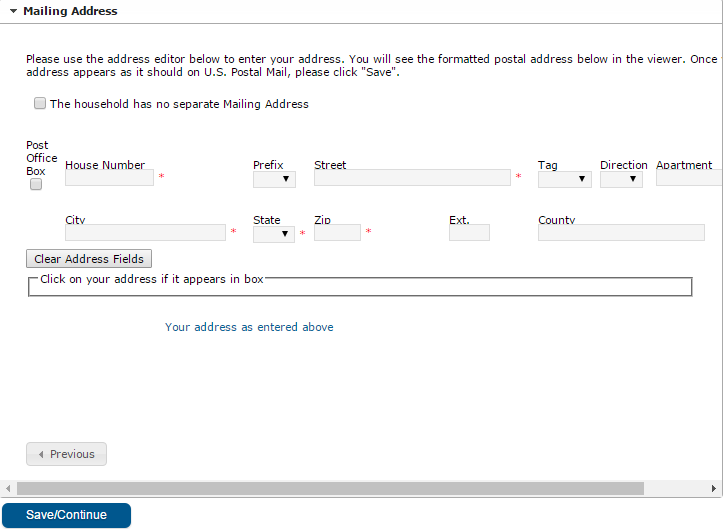 Enter Address - As you type in your address, if it appears in the auto fill list you must select it. This will ensure that the proper school is selected. 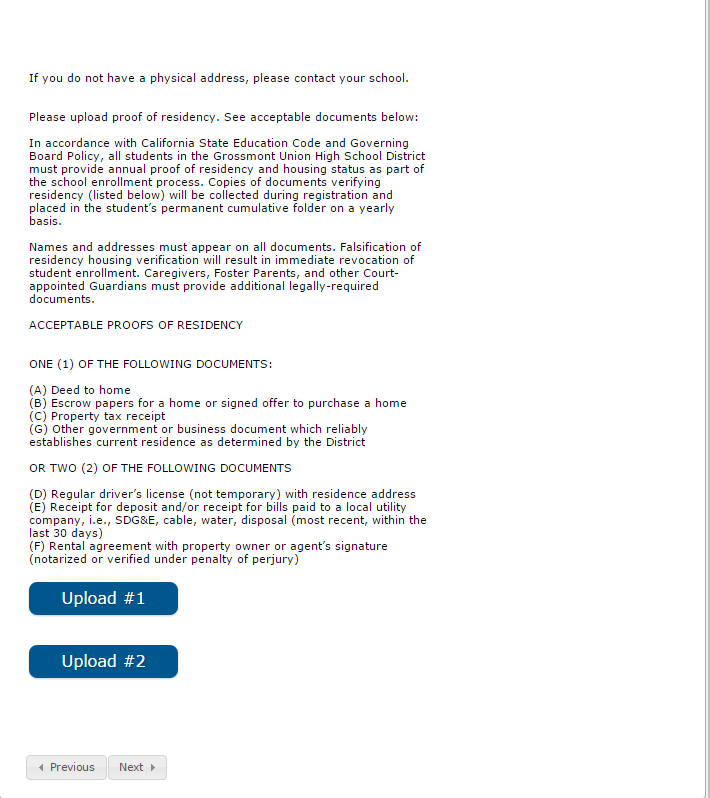 Have a pdf or image of a utility bill or driver's license ready for upload as proof of residence (upload not required - can take to student's school). 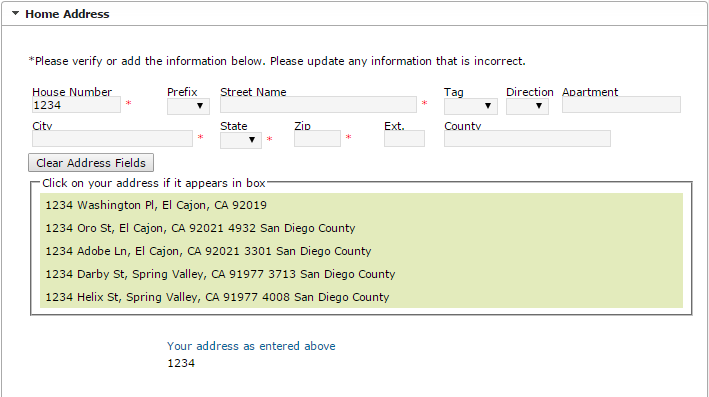 Click Next to go to the Mailing Address section. Check the box if the household has no separate Mailing Address or enter Mailing Address. 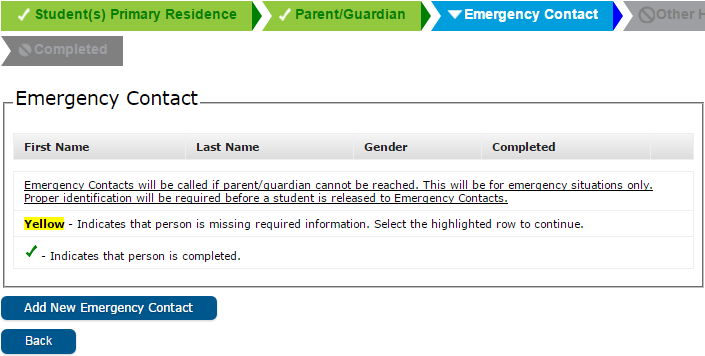 Click Save/Continue to go to the Parent/Guardian tab. Please add all Parent/Guardians including yourself in this area. 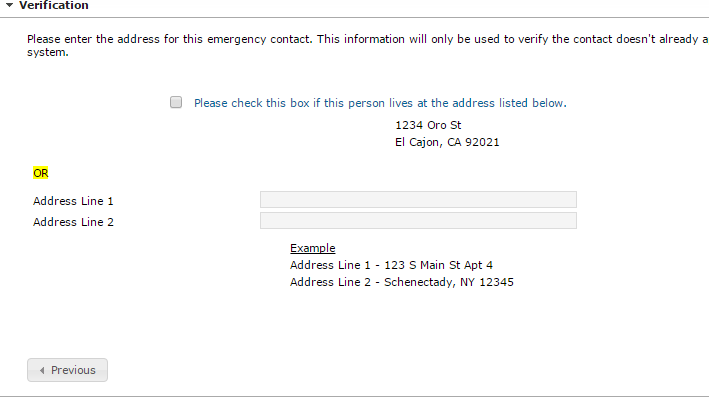 Check the box if this person lives at the address listed or enter new address. Please answer yes or no for the following questions. Please select Parent/Guardian Level of Education. 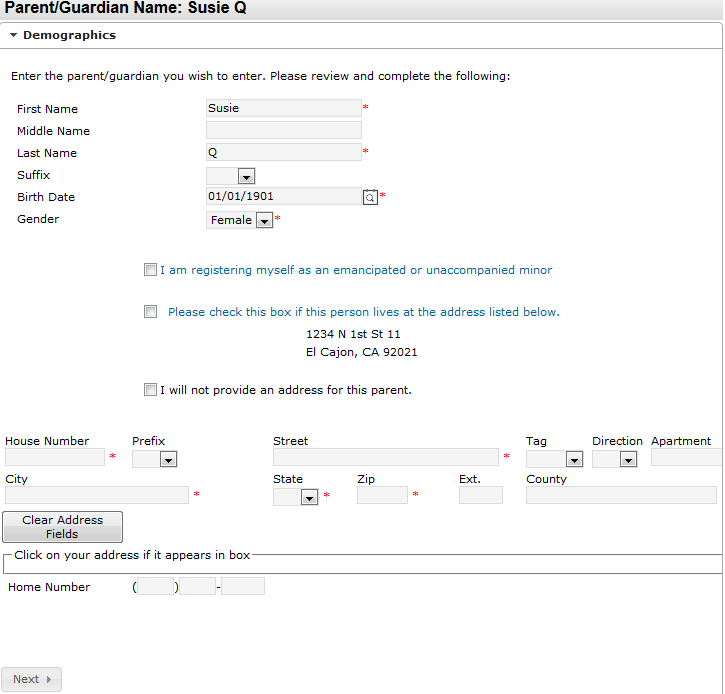 To add another Parent/Guardian click Add New Parent/Guardian or click Save/Continue to go to the Emergency Contact tab. Please answer yes or no for the following questions. If you answer yes and get a drop-down box, please fill in the box. Please CLICK HERE to apply for a Reduced or Free meal for your student. Once you click submit, you will get a pop box. If you need to go back into the application and make additions, click Cancel. If your application is complete, click OK.
Click Application Summary PDF is you would like a copy of the application submitted or close the application if you are done. 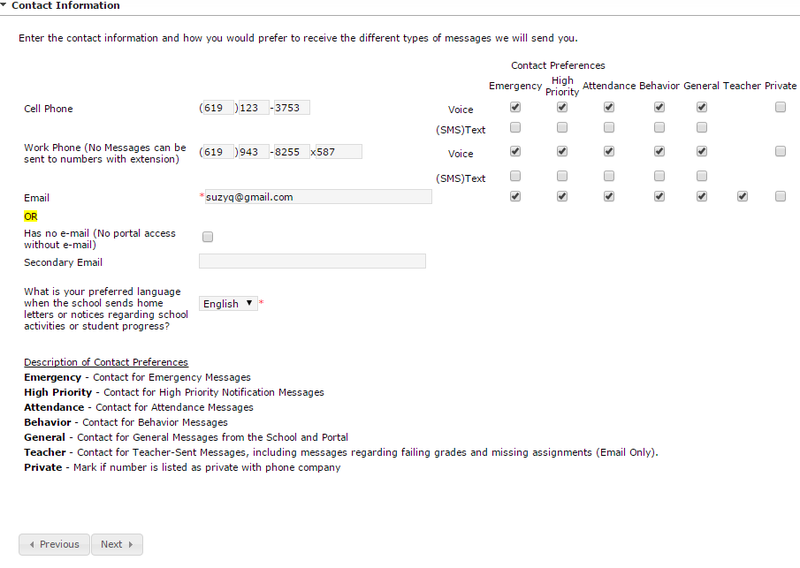 Processing of your student's Online Registration application can take between 3-5 business days. During High Volume Submissions (such as School Choice from December 2018 - March 1, 2019) the processing time may take up to 10 business days. you can complete it at your student's home school or ETS.